PHOTOS Comunicaciones Drummond Ltd. Colombia DRAFTING, EDITING AND PUBLISHING Gatos Gemelos Comunicación Revista Drummond is a publication edited by Drummond Ltd. Colombia. The opinions in the articles reflect only the view of the authors. Any full or partial reproduction of the editorial and graphic material published here without the express permission from the authors is prohibited. see in his big smiling face in a picture of him at the mine in Colombia with a child on his shoulders. He loved spending time with the kids on family days. He gave a lot of money to childrenâ&#x20AC;&#x2122;s charities and had a special place in his heart for them. He always wanted to give back and help people. He was one of the most kindhearted people I have ever known, and at the same time one of the toughest people I have ever known. Garry had been such a part of my life for so long. He was always there, and I have a hard time believing he is gone. When you work for this company and work directly for Garry like I did, I was integrated into part of his life. We went to ball games together and played golf together. We did things together as family. We dedicate this issue of Revista Drummond to Garry Drummond. This special edition will take us through Garryâ&#x20AC;&#x2122;s life in his own words. It also details many of his accomplishments during his lifetime, quotes from many of his friends and business partners, and photos that will remind us of his great character, determination and kind heart. We know that there will never be enough words to express how much he meant to all of us here at the Drummond family of companies, but we hope this magazine gives you a little glimpse. We will truly miss him. hen I first met Garry Drummond in the mid-eighties, I was a young lawyer working in a firm that helped him establish the company in Colombia. One of the things that encouraged me to join the company later on was Mr. Drummond´s tireless work ethic, straight forward demeanor and honesty. His clear objectives proved beneficial to the company’s workers and hundreds of families, who thanks to his vision and fighting spirit, forged a great company. Although he is no longer with us, the memory of his wide smile and the honest look of a just man will live in the memory of those of us who had the privilege of knowing him. employees, close to four thousand contractors and tens of thousands more who benefit indirectly, Garry Drummond´s vision and resolve has been providing major sources of revenue for the departments of Cesar, Magdalena, and Colombia as a nation. This company not only benefits the thousands of people who proudly contribute to fulfill its business objectives; it also supplies coal to countries around the globe, with which they in turn generate the energy they need for their sustainable development. I am proud to call myself a member of the extended Drummond family, and very proud to have known a great human being like Garry Drummond. He is sorely missed. ...“We know that there will never be enough words to express how much he meant to all of us here at the Drummond family of companies, but we hope this magazine gives you a little glimpse. We will truly miss him”. Graduated from the University of Alabama in Civil Engineering, began working at Drummond Company. Began working in the mines (age 14). 1938 Born in Sipsey, Alabama. 1952 1956 H.E. 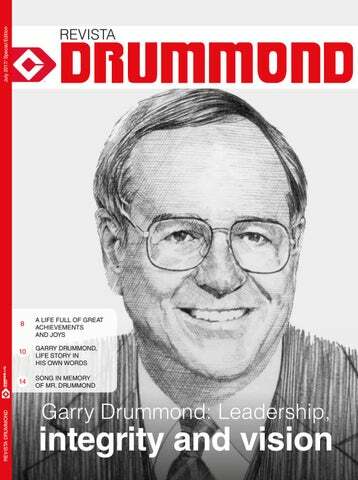 Drummond, founder of the Drummond Company and Garryâ&#x20AC;&#x2122;s father, passed away. Garry was named CEO of Drummond Company. 1970 Drummond Co. established first sales agreement with Japan facilitated by Garry Drummond. socioeconomic development of the country. Mr. Drummond left us a solid foundation on which we can continue to build a better industry and a better world. As we do our work with excellence, we honor his name. For him, obstacles were merely challenges to overcome, and he demonstrated this in the way he led the company. Drummond Co. acquired El Descanso mining concession in Colombia. Drummond Co. acquired its first Colombian Coal Concession, which eventually became Pribbenow Mine. ITOCHU Corporation became a 20% partner in Drummondâ&#x20AC;&#x2122;s Colombian operations. Inducted into the Alabama Engineering Hall of Fame. 1976 1986 1987-1989 1997 2003 2011 2016 Drummond Co. signed a twomillion annualton contract for 15 years with Alabama Power for Plant Miller. To fulfill this contract, the company purchased three 115-cubic yard draglines. Awarded University of Alabama Outstanding Alumnus. Inducted into Alabama Business Hall of Fame. Passed away at his home in Birmingham, Alabama. Excerpts from various speeches, compiled by Hillary Drummond First, let me tell you a little more about Garry Drummond. I was born in Sipsey, Alabama, in Walker County; went to school there, and later went to high school in Jasper. I was one of seven children, with two sisters and four brothers. My dad was in the coal mining business, having started his Drummond Company in 1935 when he opened a small mule-and-wagon coal mining operation. learned many things from my father while growing up, in that I saw the stresses and strains of a small company, undercapitalized, competing in a tough business. From this experience, the one thing that stands out, even today, was learning perseverance. I can remember during my early high school days that I worked with the company during the summer. Life seemed pretty normal for me up until my senior year. But then, in my senior year, my dad died of heart failure at the age of 50, and suddenly the business was in the hands of the family, especially my two older brothers who had been working full-time with my dad. I went to Auburn that fall and I wasn’t quite adjusted to college life –still an adolescent and thoroughly frustrated. This is an experience I don’t like to talk about…the only thing in my life that I can remember quitting when it was important. I quit college in the middle of the semester and came home. Until this day it comes back to haunt me and bothers me that I quit something. And as I look back on my history as a father, as a business person and engineer, and as chief executive of the company, the one thing that stands out in my mind is that the major difference in winning and losing –and I know this sounds trite –has been not quitting. You know the expression—“It’s always darkest just before the dawn”…A lot of times, the company saw the dawn because we didn’t quit. period of time, during the cold winter, I was the low man on the totem pole… primarily, I was a coal cleaner and drill operator. The next fall, I enrolled at Walker College to study pre-engineering for two years, and after graduation, I was the proud owner of an associate degree in engineering and father of two young bouncing boys. So I was off to the University of Alabama. When I started the University I had two children, and when I graduated I had three. I recall that my last math course was in differential equations, which I took during my last summer in school. After being up all night the night before at the hospital in Birmingham for the birth of my third son, I walked into the class and handed the professor a cigar and he handed me the final exam. So when I graduated [college] in 1961, I went back to Jasper, Alabama, to rejoin my brothers in the business. Why did I do that? My grades were fairly good and I had some of the better job offers, but chose to go back in business with the brothers—because I loved the coal business and knew something about it. We had a small company…It was something to be built. From this experience, the one thing that stands out, even today, was learning perseverance. Our investment in Colombia is the strongest testimony one could give for belief in the future of that country. I believe in the future of Colombia. During the following year we had to handle a make-or-break decision. In 1962, we started a new operation that required us to invest some $300,000. The operation was having cash flow problems, and even though it was manageable, it was scary at the time. A decision was about to be made to quit with this operation, and default on payment of a large commitment we had for the purchase of equipment. After a lot of discussion it was decided that we would gut it up, and go ahead with the operation and not quit. As I look back at the history of the Drummond Company today, it is just as important in my mind now as it was back in 1962â&#x20AC;&#x201D;that default was the wrong thing to do. Our company would not be the company that it is today, and maybe no company at all, if we had not made the right decision at that moment. The past 50 years have been the growth period for our company. 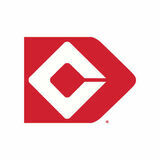 From a ten-million-dollar asset business as late as 1970 to a company with billions of dollars in sales today. We have truly become an international company. This was done by a private companyâ&#x20AC;&#x201D;a company owned by my immediate family. We compete in a business thatâ&#x20AC;&#x2122;s owned mostly by large publicly held international corporations with access to public equity. Drummond is primarily in the coal business, but we are also the largest producer of foundry coke for the U.S. casting industry. We are also in the real estate business in the U.S., with developments featuring world-class golf courses. But coal is primary. Why? Because coal is here to stay as a major supplier for energy and other very necessary uses. Coal is absolutely vital for the economy of the world and the health of its people. And that is not going to change any time soon. Drummond Company is extremely impressed with its potential in Colombia and has confidence in its future there. Since I am investing my family’s money and not the money of thousands of stockholders, to me, our investment in Colombia is the strongest testimony one could give for belief in the future of that country. I believe in the future of Colombia. What is the future for coal? Coal is here to stay, and it will remain as one of the solid foundations of the world’s energy requirements for the future. And those requirements are staggering. Increased energy use is both the fuel for growing economic systems, and the inevitable result of this growth. have, or should we diversify our investment to other forms of energy, or other businesses? Coal is going to grow. I’m betting my future and my family’s future on just that. Coal is here to stay. I would like to leave you with this thought. The improvement in the lifestyle of the people of the world depends on energy. The economic well-being and the reduction of poverty among the very people of the world depend on energy. The very existence of the people of the world depends on energy. And I’m very proud to be in the production of energy. In closing, coal has been good for the Drummond family. In 1943, my dad borrowed $300 to carry on his business. He mortgaged three mules as collateral for this loan. We have lived the American dream. We have lived the entrepreneurial dream. Song in memory of Mr. Drummond Eduard Chavez BeleĂąo - Loader Operator, Roads - Group 1, Pribbenow Mine, composed a song in honor of Mr. Drummond, in which he expresses his sincere admiration, affection, and respect for everything he did for the company and for Colombia. r. Drummondâ&#x20AC;&#x2122;s enterprising spirit brought benefits to thousands of Colombians and continues even now to produce a positive impact on our lives. He left an indelible imprint on our hearts that spurs us on to be better day by day. Through this song, one of our workers expresses this mixture of emotions. and memorial service A heartfelt ceremony was held at the facilities at the Mines, at which the workers were able to say goodbye to Mr. Drummond. The following are some photographs of the service, which put in evidence the affection and admiration his employees feel for him.